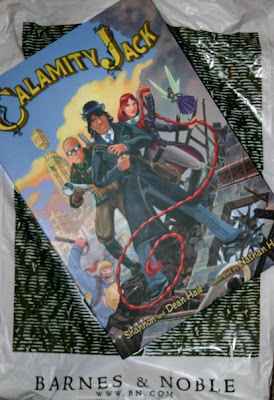 SPACE STATION NATHAN: Spotted in the Wild: A CALAMITY JACK! I will be fighting off three of my children for the rights to read it first. I really liked Rapunzel's Revenge. I'll have to get a copy of this for sure. Amazon is getting mine to me. Oh bummer! This sounds really really cool but I am ordering my copy from Amazon and it won't be here by Tuesday. My 9 y.o. son and I are big fans of your work!